Our large, fresh topiary will quickly become a topic of conversation at your holiday gathering, and will look adorable in your home, or greeting your guests at the front door. Festive for the holiday season is our fresh topiary reindeer would make an interesting addition to your holiday decor. The English ivy will gradually spread over the moss filled wire frame to complete the look. The large, fresh topiary will quickly become a topic of conversation at your holiday gathering, and will look adorable in your home, or greeting your guests at the front door. 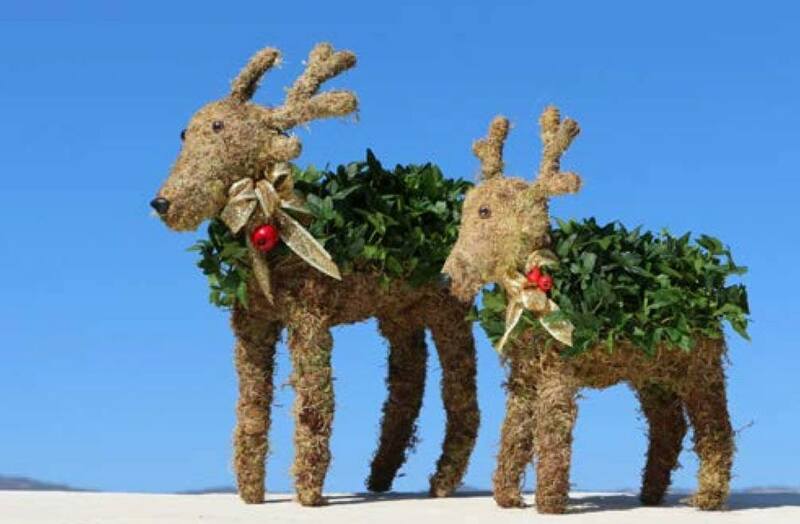 Set the stage with one or two of these reindeer topiary plants amidst poinsettias, or perhaps peeking out from behind your holiday tree. Order today to ensure the topiary plants arrive in time. Dress your holiday display to impress this year by bringing the outdoors in with this fun fresh topiary formed in the shape of an adorable reindeer. This delightful brown-mossed live ivy reindeer topiary is a festive and unique way to liven up your indoor or outdoor holiday display and will have your friends wondering where you got your green thumb. The vivid verdant ivy is a bright accent bringing the reindeer to life in any display. As the ivy grows, it will develop into lush, dense foliage surrounding the reindeer figure. Live topiary plants are custom crafted, live plant decorations that are easy to maintain and are beautiful on their own or in groupings of multiple, differently sized topiaries. Topiaries add an air of elegance to any room and may be kept potted indoors or planted outdoors. This fresh topiary display is accented with soft, brown moss and is shaped in a cheerful reindeer form with a fresh green ivy plant that will grow around the sculpture. It is freestanding and may be arranged a variety of ways including in foyer displays, mantle arrangements and more. Tie a bow around its neck or add sprigs of holly to round out this merry display. These living sculptures are a tasteful addition to holiday décor and are ready to display upon delivery. Choose the Mossed Ivy Reindeer Large Fresh Topiary as an ideal gift for party hosts and others on your gift list. Buy one for yourself and present your friend with one too. This whimsical live sculpture is a perfect statement piece on tabletop arrangements, foyer displays and more. Order as party décor for a dazzling arrangement and keep it as a long-lasting display in your home. The fresh green ivy will twist and twirl around the reindeer shape, effectively providing a dynamic living sculpture. Ivy may be kept in a pot or planted outdoors for a fun and beautiful garden display. Trim leaves back to maintain the shape of the topiary. On this sculpture, the ivy is planted in natural moss which is formed around a wire form. No matter your style, this merry reindeer will be a striking addition to your holiday display. Set up your topiary and enjoy the compliments on this original decorative piece. Caring is easy to care for and does well in most environments. Let soil or growing medium approach complete dryness between watering. Upon watering, do not soak or let roots sit in standing water. This will cause root rot and mold in the planting material. Sprinkle vine with water to keep fresh and pest free. Exposure to bright, indirect light is recommended, and an ideal temperature is around 40-80° F. The topiary weight is 3.25 lb and height is 18.5 inches. There is no pot to worry about.